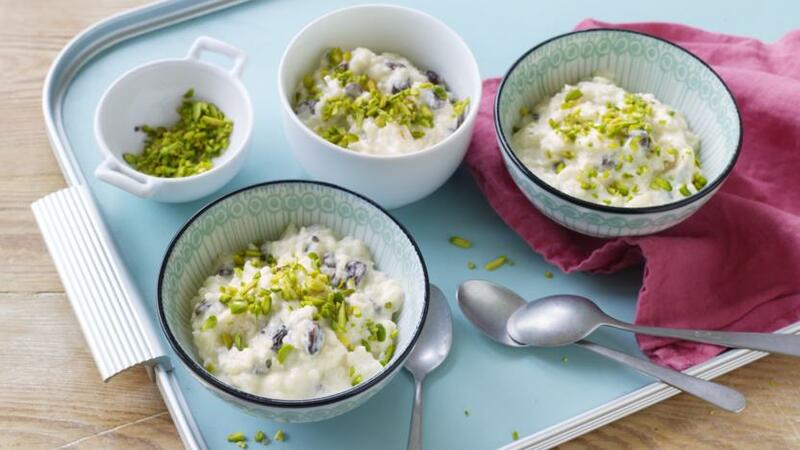 This Indian rice pudding is made with almonds and sultanas and scented with cardamom. Tip the rice into a large saucepan and toast over a low heat for a few minutes. Stir in the milk, cardamom and almonds. Bring to a simmer and cook, uncovered, for 40 minutes. Stir in the sultanas and simmer for 15–20 minutes, or until the liquid has reduced by half and the mixture has thickened. Stir in the sugar, to taste, remove from the heat and allow to cool. Pour into a large bowl, cover with cling film and chill in the fridge for 1–2 hours, or overnight. Pick out the cardamom pods. Serve in four bowls decorated with crushed pistachios and gold leaf (if using).